The lifetime toxic chemical releases from coal-generated electricity are 10 to 100 times greater than those from electricity generated with natural gas obtained through hydraulic fracturing, a new study suggests. The study is a comparative analysis of the harmful health effects of electricity produced from shale gas and coal. It looks at the amount of toxic chemicals released into the air, soil, and water during both the resource extraction and electricity generation phases of both technologies and concludes that the potential human health impacts of electricity from coal are much higher. The findings suggest that as the US energy market continues to shift from coal to natural gas, the overall “toxicity burden” of the electricity sector will decrease, says the study’s corresponding author Shelie Miller, an environmental engineer and an associate professor at the University of Michigan School for Environment and Sustainability’s Center for Sustainable Systems. 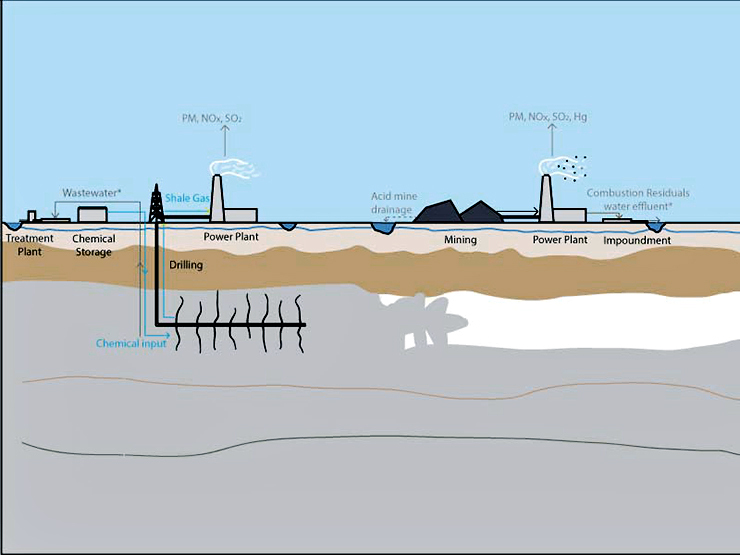 Illustration of a shale-gas electricity system (left), including hydraulic fracturing operations and electricity generation. At right, sketch of a coal electricity system, including coal mining and electricity generation. (Credit: Environmental Science & Technology via U. Michigan). In recent years, the combination of horizontal drilling and hydraulic fracturing (commonly known as fracking), have helped unlock vast stores of natural gas in shale formations. Increased shale-gas production created a boom in some parts of the country but has also led to concerns over potential contamination of drinking water and possible human health impacts related to hydraulic fracturing. Given those concerns and the ongoing shift to shale gas, Miller and her colleagues felt it was important to place into proper context the potential human health impacts of shale gas relative to coal. In their comparative study, called a lifecycle impact assessment, the researchers used Pennsylvania as the point of origin for both shale gas and coal, since both energy sources are abundant in the state. For the coal system, the study estimates the toxicity associated with air pollutants emitted during power generation, as well as toxic chemical releases during the coal-mining process from acid-mine drainage and coal-ash impoundment. The air pollutants analyzed for the coal system included particulate matter (soot), mercury, volatile organic compounds, nitrogen oxides, and sulfur oxides. For the hydraulic fracturing system, the study estimated the toxicity of the fracturing fluid chemicals used to crack rock and release natural gas, as well as the wastewater associated with shale-gas extraction. The researchers also looked at air pollutants emitted during both shale-gas extraction and electricity generation. In both systems, particulate matter released into the air from power plants during electricity generation was the dominant toxicity contributor and outweighed chemical releases that may occur during extraction. And the harmful air emissions from coal-fired power plants were much worse than those from cleaner-burning natural gas plants, Miller says. While the results provide a comparison of relative toxicity between the two systems, large uncertainties and lack of data precluded a full-blown risk assessment. Much of the uncertainty relates to the hydraulic fracturing process. The chemicals used in hydraulic fracturing fluid are considered proprietary, and the magnitude and frequency of water-contamination events are not well-documented. When faced with uncertainties about the chemicals used in the hydraulic fracturing process, the researchers deliberately overestimated the amount of toxic chemicals that would reach the environment to ensure they weren’t minimizing fracking’s health impacts, Miller says. Even in a seemingly implausible accidental-release scenario in which all of a well’s hydraulic fracturing fluid and untreated wastewater were discharged directly into surface waters for the lifetime of the well, shale-gas electricity had a lower lifetime human toxicity impact, or HTI, than coal electricity, according to the study. To calculate the health impacts of particulate matter from power plants, the researchers collected emissions data from 23 natural gas and 13 coal-fired power plants in Pennsylvania. They also used data from 2,900 hydraulically fractured wells in the state to estimate potential releases of fracturing fluid chemicals and wastewater. Researchers used two different assessment methods to estimate health impacts. They conducted various statistical tests to verify the results, suggesting 90 percent confidence in the overall finding that the HTI of shale gas is lower than the HTI of coal. Did the E.P.A. miscount natural gas emissions? The researchers report their work in the journal Environmental Science & Technology. The University of Michigan Water Center, the university’s M-Cubed program, and a grant from the National Science Foundation supported the work.